This Macduff is part of the 24 x 20cl bottles that make up the Carn Mor Vintage Collection. Distilled in 2005 and bottled in 2009, it’s from a limited edition of 1563, Cask No: 23. Non-chill filtered, no added colour and 46%. 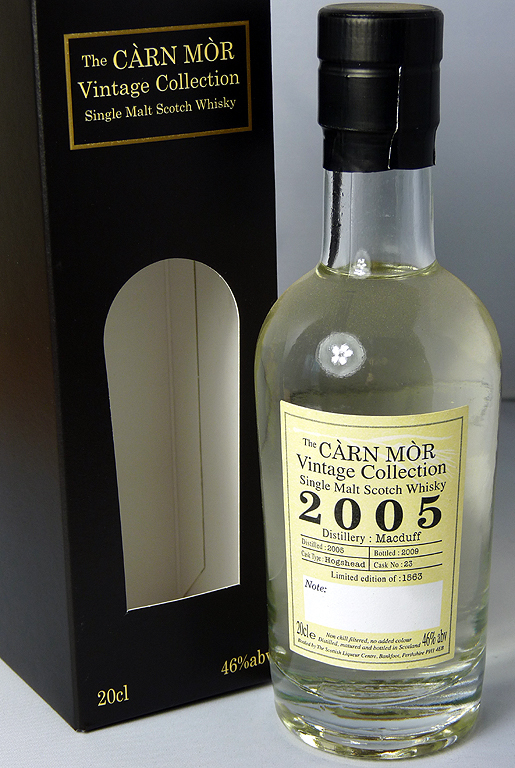 This is my 11th and final bottle I’ll be getting from the Carn Mor collection. I was never intending to get all 24. The bottles I have give me a good range of ages and distilleries. The main reason for buying them was to further my collection of distillery examples at the best price possible. 20cl bottles are very handy because they’re a lot cheaper than full bottles and last longer than miniatures. My only complaint is that these quarter bottles seem hard to find. More distilleries should be doing them in my opinion. This wont be my final bottle from Macduff. The distillery’s flagship malt is the Glen Deveron and the 10yo gets 86/100 in the Whisky Bible 2013. The review goes on to say that it would score in the low 90s if it was 46% and lost the addition of caramel. Perhaps if it ever does that’s the day I’ll buy a bottle. It’s on my wishlist for the future! This entry was posted in Macduff (aka Deveron) and tagged 2005, 20cl, 46%, C Gar Ltd, Carn Mor, Highlands, Macduff (aka Deveron), NAS, Single Malt. Bookmark the permalink.